Who doesn’t like a scientific breakthrough? The media buzzes with news from the frontiers of science that directly affects us: biological and medical research. The stories that really get our attention are those in which new technologies solve medical mysteries or save lives. Last week, for example, the New York Times reported on a Wisconsin boy who almost died before doctors used DNA sequencing to identify the cause of his life-threatening illness. Last month, CNN.com reported that doctors at the Mayo Clinic had used “…a highly concentrated, lab-engineered measles virus similar to the measles vaccine” to put a patient’s deadly cancer into remission. When I read stories like these, I get excited by the possibilities for better health; however, I also feel like something is missing. In the Wisconsin boy's case, I wonder how the University of California researchers were able to run tests that are used to guide treatment of a patient who is not in a research study. The measles story gets me thinking about what has to happen for that treatment to become part of routine clinical care outside of the Mayo Clinic. These stories are small pieces of something much larger, which at a high level is pretty straightforward: people get treated for diseases using drugs and diagnostics that are developed by companies from discoveries funded by government at academic labs. But when you look closer, it gets complicated. Once you start talking about clinical trials, regulations around the use of lab results, and who pays for all this effort, people -- including me -- get confused. So I started thinking about it a little more. Groundbreaking news isn’t enough to help us really grasp biomedicine. We need to see earth-shattering breakthroughs, as well as important baby steps, in context. How do drug and diagnostic companies create new products based on university and government research? How do doctors know which of those products is best for the patients in their care? How do insurance companies know what care they should pay for and how much? How do healthcare consumers know that they and their families are getting the best care? I decided that we need a map. One where you can zoom in to see particular areas -- like those news stories -- up close and understand how they came to be. 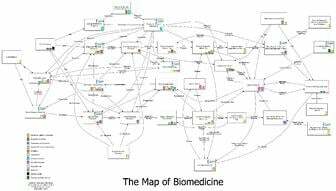 We also need to be able to zoom out and see how those stories fit into the much bigger picture of biomedicine. ... 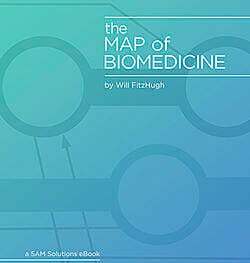 So I Made a Map of Biomedicine. At first, the map was for me so that I could understand the world in which 5AM Solutions operates. Then I starting thinking that it could be useful for lots of people. For example, when I started working at a pharmaceutical company over ten years ago, I was coming from a research institute. I had no idea how drugs got developed. I had to learn it piecemeal from working on projects over a period of years. Another example is that companies that produce instruments that have traditionally served the research market are now focusing on clinical applications. This means they have to understand a much larger and more complicated space. 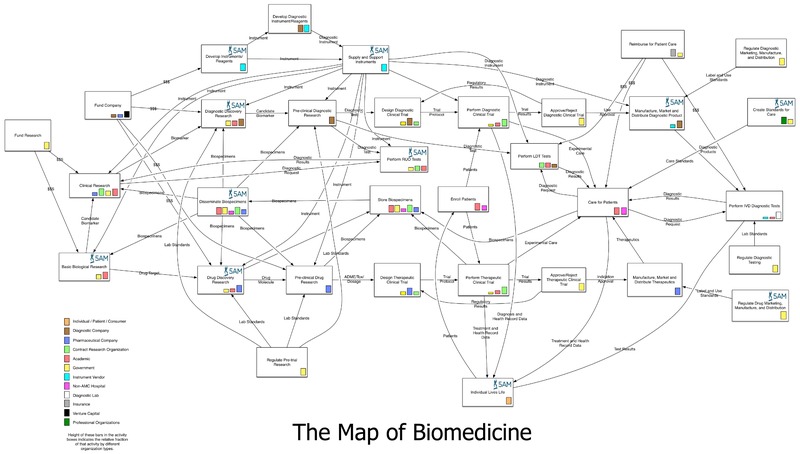 This post is the first in a series in which I’ll be diving into the Map of Biomedicine, and showing how it represents complex processes and how we can use it to better understand how biomedicine works. Admittedly, the Map is labyrinthine, but I won’t let you get lost. I’ve divided it into three areas that I’ve been calling “vignettes”. Each vignette is a snapshot in the big picture, and inside each vignette, there are shorter stories that home in on how the map operates in real life. It’s going to be an interesting journey, and I’m looking forward to your feedback and comments.